So much has been written about Devonshire House, most of it concerning the period of the Devonshire House Circle, presided over by the beautiful Georgiana, wife to the 5th Duke. After such brilliance, it seemed anticlimatic when the house was inherited by the 6th Duke, William “Hart” Cavendish, a man witty and handsome. Alas, because of a disability, he was unable to carry on his mother’s significant political career and leader of the Whig circle. One of my characters, Lady Diana, quite liked the young duke whose Devonshire House gardens abutted those belonging to her friend, Louisa, Marchioness of Lansdowne. Long after those days when it was thought they might make a match of it, Diana heard that Hart was planning to leave London. Hart reached out and stroked the fine organza of her sleeve. He sometimes did that with beautiful women, taking the opportunity to touch them under the excuse of having to stand close by to capture the fading sound of their voices. Sounds that had become almost inaudible. The sixth Duke was really far more important to Devonshire House than his mother ever was. He had carried out necessary repairs and renovations, refreshing the gilding and the like, before leaving London in the 1830s. 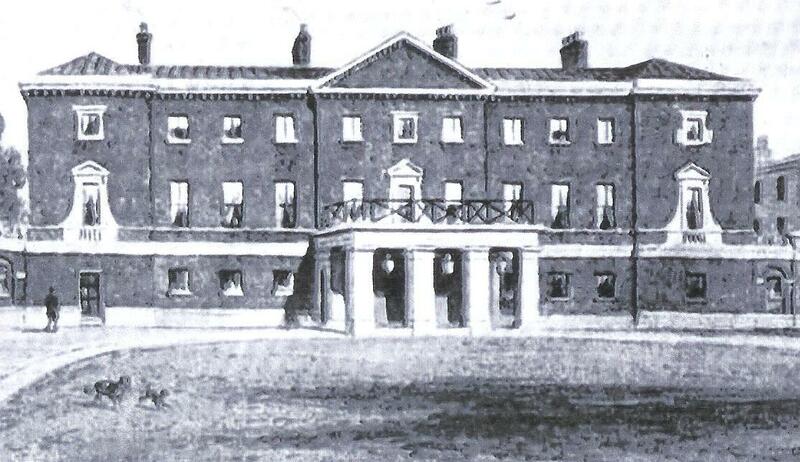 But by the 1840s, he had returned and transformed the Piccadilly mansion. When Devonshire House was demolished, it was already in a somewhat dilapidated state. The large brick wall that shielded it from the street (built in the eighteenth century to deter burglars that plagued London’s great houses) was a magnet for graffiti. There were only a few statues remaining in the gardens. The house was sold in 1920, along with its three acres. All of it, including the crystal staircase were soon to be nore more, lamented in a poem by Siegfried Sassoon. But all was not lost. Thanks to an intrepid duchess, the house lives on, in bits and pieces. They are by and large the legacy of the sixth Duke. These numerous Regency pieces are to be found in the most surprising places. This entry was posted in Notorious Match, Regency, Uncategorized and tagged 6th Duke of Devonshire, Devonshire House, Siegfried Sassoon, William Cavendish by Angelyn. Bookmark the permalink. Great Blog!! I love reading about older houses with great history have been not completely destroyed. It’s even more great to know you can preserve it in history in your novel! I do hope you’re going to do a follow up blog and let us know about the surprising places these Regency pieces ended up. Absolutely–there are some marble steps I have my eye on—strange where they wound up! I arrived at my fascination with Chatsworth sort of the wrong way around — my fascination with the (now) Dowager Duchess, Deborah Devonshire, in my opinion the nicest of the Mitford sisters. Her writing about what Chatsworth is now, and how they managed to keep it that way in spite of her father-in-law’s inconvenient death in terms of death duties, is charming. Oh–I’ll have to read up on that. I’m familiar with Her Grace’s efforts to preserve things but haven’t read her writings. Thanks, Beppie! Great post, Angelyn. I want to know where the staircase went to as well. Sorry I was so late commenting. I know you’ve been busy—glad you could stop by! Angelyn, just managed to make it for your post. So interesting. Like the others, I hope you’ll tell us where some of those bits and pieces can now be found. I’m glad you find these interesting, Barbara–yes, next week we’ll troll for the bits and pieces. I love how you have a category called “Notorious Match!” Sooo fabulous! It’s the title of Diana’s story, a Regency manuscript of mine. Not sure if it will become anything more than just a blog category at this point. Thank you for stopping by!